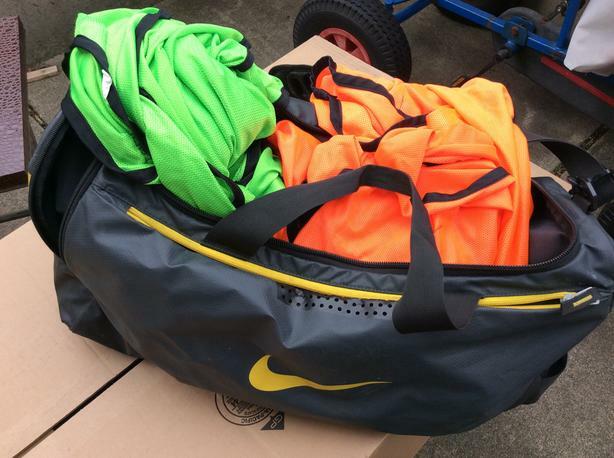 Set of 1 Nike Team Training Max Air Medium Duffle Bag + 10 green & 10 orange opposing colored training vest (brand Sporteck). This gives you an easy way to divide teams during training to help players easily distinguish teammates. Made from polyester. One size fits almost all. The Nike bag has adjustable shoulder strap with with shock absorption, a dual-zip main compartment, made from water-resistant coated polyester and tarpaulin bottom. The bag has a ventilated wet/dry storage. Dimensions are 24 by 12 by 12; in good used condition. Thank you.